Preheat the oven to 140C/gas 1. Coarsely grate the courgettes into a large mixing bowl and sprinkle with a good pinch of salt. Set aside for 5 minutes. Meanwhile, make the salsa: whisk together the olive oil, lemon juice, cherry tomatoes, lemon rind, olives and mint and season with black pepper. Set aside. 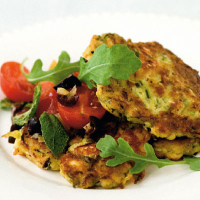 Cook 4 fritters at a time for 3–4 minutes each side until deep golden and cooked through. Keep warm in the oven. Serve 3 fritters per person with some rocket and a spoonful of salsa.